Soyons Cruels (Let's be cruel) is one of many slogans that appeared written on the walls of the Sorbonne or in the streets of Paris in the short time leading up to the student and worker uprising and general strike in May, 1968, which nearly brought down the conservative De Gaulle government. France at the time enjoyed relative prosperity, but the freedoms and wealth of the ruling classes had largely failed to trickle-down to the lower classes. At the moment, we have a "popular uprising" in this country (funded by corporations and billionaires and promoted by right-wing media). It is inherently cruel at heart--a conservative movement that is based largely on denying social services to the poor (and middle-class); opposing the rights of immigrants, women and minorities; exploiting natural resources and re-instating a repressive sexual code, while continuing to enrich the already wealthy and co-opting the support of some of the very citizens it will hurt most. 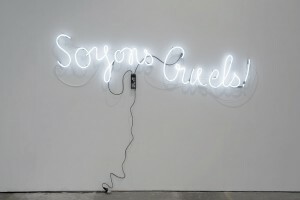 Pascual Sisto's rendering of the Soyons Cruels slogan in neon (2010) creates an ambiguity, an irony, in which the imperative is both complicated and reduced, literally to a sign, commodified into an art piece and exhibited in the window of a retail store in downtown Los Angeles--a complex community that includes wealthy developers, small business owners, artists, and a large homeless population. We might not know the exact intent of the original writer in the original context, but now in the current political climate we can take it as an indictment of run-away materialism, right-wing conservative politics and the shallow, short-sightedness of any ideology that resorts to cruelty to further its aims. Biography: Raised in Barcelona, Spain, Pascual Sisto graduated with a BFA from the Art Center College of Design in Pasadena, California, and a MFA from the University of California, Los Angeles. Recent exhibitions include the Istanbul Museum of Modern Art (Istanbul, Turkey), the Centre d’Art Santa Monica (Barcelona, Spain), the Internet Pavilion at the Venice Biennale (Venice, Italy), Five Thirty Three Gallery (Los Angeles, USA) and Arti et Amicitae (Amsterdam, NL). Pascual Sisto lives and works in Los Angeles. For more information on the artist, please visit http://pascualsisto.com/.